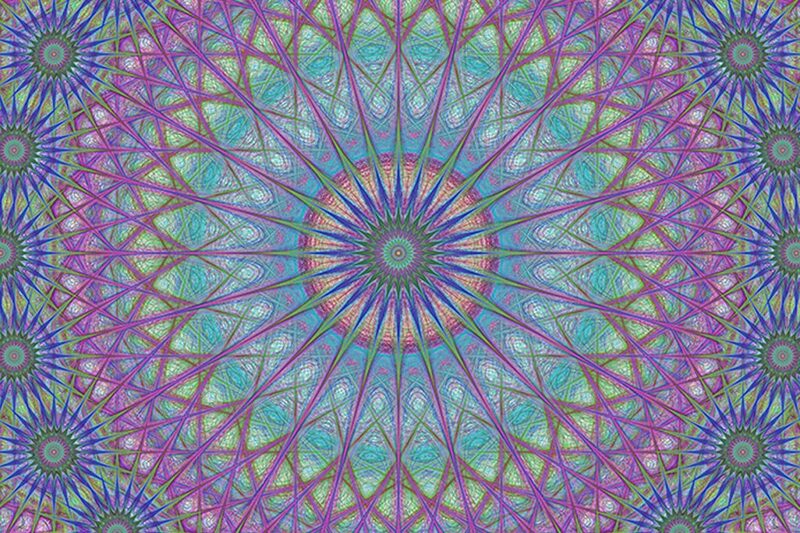 The amazing feature about kaleidoscopes is the endless, ever-changing scenes and complex patterns they reveal to anyone who takes the time to look. The gentlest of rotations invites a new and oftentimes completely different perspective on the same set of colorful shapes. Working with children, adults and families involved in the child welfare system is not so different. A vast array of interplaying events, reactions, concerns and characteristics make up a mosaic of factors that drive a counselor’s assessments and interventions. Any counselor who has worked with one or 100 cases involved in foster care understands how complex and overwhelming it can be to help this population. However, in using the metaphor of looking through a kaleidoscope, we are reminded of how one gentle turn of our focus can change our perspective of the case at hand in a way that will continuously drive more attuned, meaningful interventions. Knowing that the myriad shapes exist before, during and after our treatment with these clients, we can more easily remain open both to seeing and making sense of our clients, the child welfare system and its players, as well as our own experiences of these cases. Given that each turn of the kaleidoscope brings a new feature into view, we have some idea of the shapes that are there: neglect or abuse, histories of mental illness and substance abuse, court involvement, grief and loss, trauma and attachment. One element might stand out from the others at different times during treatment, but all are present in the kaleidoscope, and we should always acknowledge them throughout the course of treatment even when they don’t dominate our view. In this article, which is based on our book Therapeutic Interventions for Families and Children in the Child Welfare System, we will provide an overview of six perspectives, or “turns of the kaleidoscope,” to take with these cases. These perspectives focus on specific considerations and guided structure to drive effective intervention and counter burnout when working with this population. When a client is involved in the child welfare system, instead of beginning treatment with assessment, start with a curiosity about the client’s worldview (whether that client is a child or an adult) and a desire to understand that worldview better. This process builds empathy for the client and reminds counselors to evaluate possible motivations for the presenting behavior concerns. What is it like to be a child in foster care? What is it like to have your child removed from your care? What it is like to care for a child you don’t know in your home? Children in foster care wonder if they will ever be safe, and if a child has experienced frequent foster home place disruptions, this fear only intensifies. Birthparents’ worldviews begin with the helplessness and hopelessness that humans feel at losing their children. Grief and loss are compounded by judgment from family, friends, court personnel, therapists and case managers. The reason for removal, such as ongoing substance abuse, their own history of trauma or attachment issues, possible mental illness, poverty or a lack of educational opportunities, is further complicated when their family enters the child welfare system. Often viewed as resistant or unwilling to accept responsibility for their actions, these birthparents often feel alone and angry and use their energy to defend themselves against the onslaught of judgment. Ironically, foster parents’ worldviews may also begin with helplessness. Although they receive training and support, sometimes it is not enough to counteract the effects of caring for a child in their home who is angry, traumatized, grieving and filled with anxiety. In fact, the experience of foster parents can be similar to that of the child’s birthparents in that they are quickly judged and required to abdicate control in their home to the child welfare rules and a series of child welfare workers. Foster parents are also asked to love a child and then let that child go, so they struggle with attachment, grief and loss issues on a constant basis. As counselors, what we see in others is often influenced by our own family histories, personal values and clinical experiences. These issues rise up early in the child welfare system, where counselors are often novice professionals just starting out, and they are given clients with chronic treatment issues who have often seen myriad other professionals. Meanwhile, the pressure from the systems and individuals involved is often overwhelming. Counselors often feel responsible to “fix the kid” or “fix the family,” and this pressure can lead to countertransference, ethical violations and burnout. These children and families often exist in chaos, and counselors can easily be pulled into that chaos by a system that expects miracles but provides minimal support. The child welfare kaleidoscope can become a series of fast-approaching shapes, constantly spinning with what appears to be little direction, or it can become stuck, making it difficult to move or view another shape. Counselors must always be on guard against the creeping sense of helplessness and the compassion fatigue that can occur when working with this population. Counselors must also combat the countertransference that can force the kaleidoscope to become stuck on one shape or color. Seeking qualified supervision with professionals who are experienced with this population can make a world of difference. Making self-care practices a necessity rather than a commodity will help protect counselors against compassion fatigue. When working with this population, counselors can be pulled toward feeling pity or overwhelming sympathy for these clients. On the other side of the coin, they can find themselves judging or feeling angry with these clients, either for how the adults behave toward their children or how the children seem ungrateful toward the adults. These are all ineffective responses, both for the counselors and for their clients. Using the metaphor of a bridge, remember that to stand in empathy is to stand on the rickety, scary bridge over raging waters to allow ourselves to feel what our clients feel. Either side of the bridge — pity or judgment — feels “safer,” but they both lead to ineffective therapy and further harm to the client. Closely evaluating your own personal values before beginning this work and knowing the child welfare laws in your state will provide necessary support to curate an empathic, realistic perspective on your cases. Working with children in foster care also can be a minefield of ethical issues. Confidentiality can be complicated depending on the referral source and the child’s legal status. For example, the birthparent of a temporary ward of the court still possesses legal rights and must be consulted over treatment issues. At the same time, the child is placed in foster care, and foster parents need to be made aware of important issues that might impact the child in their home. The court might subpoena therapy files, and caseworkers also require treatment updates and recommendations. Each of these possible breaches is relevant to informed consent with this population. The issue of mandated reporting can also become a prominent part of treatment. Children may disclose abuse in the birth home, foster home or both. Managing the ongoing relationships with birthparents and foster parents when required to report suspected abuse or neglect requires counselors to be honest, forthright and empathetic at all times. Finally, facing clients with complicated trauma, grief and attachment histories can become demoralizing for counselors because they rarely see the type of progress that allows for professional satisfaction. The potential for experiencing vicarious or secondary trauma responses is also high. Counselors working with this population should engage emotional support from peers, supervisors and even their own counseling. These actions can help heal emotional wounds, keep the work in perspective and prevent the type of burnout that ends up hurting rather than helping clients and counselors alike. Assessments with clients involved in child welfare must be understood as living documents of sorts. After all, anything captured at one particular time can be expected to shift because of the unstable nature of so much that influences the client’s life in profound ways. Counselors should obtain ongoing strategic updates on the child’s behavior, emotional status and the status of the relationship with the birthparent, then adjust goals accordingly. For example, try to find out when a placement transition or court-ordered change in permanency status takes place, when the client experiences an additional loss or traumatic exposure, or when the client newly acknowledges a past traumatic exposure. Counter to the tendency of many counselors to see the concerns of each case first, this population greatly benefits from intentionally identifying their strengths during the assessment process. Children and adults who are involved in the child welfare system often possess amazing resilience, creative coping skills, abundant humor, deep love and extraordinary courage. Assessment of the child begins by listening and watching: listening to a child’s stories, listening to the reports of both the foster parents and the birthparents, and watching how the child plays and interacts with you, other siblings and adults. Attachment style will be evident by whether the child seems angry or withdrawn from adults, or whether the child clings and appears fearful. The child’s response to trauma will be evident through sleeping patterns, the way the child eats and the level of fearfulness the child exhibits at home and at school. Educational information and potential medical concerns also may be highly relevant to interventions. In addition, the amount and type of losses the child has endured and the child’s grieving process matter greatly. Taking session time to normalize the child’s reaction to removal from the home and any subsequent placements can have a significant impact on the child’s adjustment efforts. Finally, after examining and prioritizing behavior problems and building an understanding of what is driving them, work with the families to create a realistic and achievable plan that focuses on one or two concerns at a time. Using this approach, the counselor can keep the many parts of the client’s kaleidoscope in mind while knowing that trying to work on everything at once would be ineffective. One common challenge in working with this population is the tendency to turn therapy into nonstop crisis intervention sessions, responding to the complaints of foster parents or case managers rather than holding steady to the set treatment plan. Although crisis management is necessary at times, learn to determine what is truly a crisis (e.g., suicidal ideations, homicidal ideations, an immediate risk of removal) and what qualifies as an ongoing complaint (e.g., trouble in school, acting out in the foster home). Holding focus on just two or three shapes at a time prevents therapy from turning into a nonstop process of confronting the child. Beginning treatment for any primary concerns with this population must focus on giving the child and family space to feel safe and comfortable. For example, get on the child’s eye level, allow the child to move freely throughout the room, and be clear and open about what therapy is and is not. Because treatment is often specific to the needs of the child, be sure to research and seek training in specific interventions related to trauma, attachment, grief and loss, or behavior issues. The following brief case studies illustrate an intervention for each treatment issue listed above. Trauma: A 15-year-old girl came into care for the second time in her life because of allegations of sexual abuse by multiple family members. She barely was eating or sleeping and kept her body and hair covered with multiple layers of clothing at all times. The counselor took time to connect with her in simple ways that she could handle — drawing, listening to a song she liked, smelling a favorite hand lotion, updating her on the status of her many siblings and naming how much had changed since she had come into care and how normal it would be to feel overwhelmed. Creating this routine of predictable, soothing interactions built a sense of psychological safety in the therapy space. From there, the counselor helped her learn how to lower her arousal enough to open up about her inner world. This allowed her to begin the long and life-changing intensive trauma treatment process that had previously been inaccessible to her. Attachment: The counselor used a metal Slinky as a transitional object with a 7-year-old boy who refused to enter the counseling room. The counselor brought out the Slinky, and the boy played with it as he ran around the waiting room, not responding to verbal prompts or directions. When he stopped, he and the counselor would go and walk the Slinky up and down the stairs. After three sessions, the counselor stated that to play with the Slinky, the boy had to enter the counseling room. He was able to enter for a short time in the first week and stayed for the entire session from that point forward. Grief and loss: An 11-year-old girl had witnessed her mother die of breast cancer in her home. The child had limited verbal skills and would draw pictures of herself jumping rope with her mother in the sky. Using her art, the counselor encouraged her to draw herself as she currently felt. She drew herself crying with her mother in the sky. As treatment progressed, she could draw herself smiling as she jumped rope, and this action was identified as showing her mother that she was coping. The counselor arranged to have the pictures sent to her mother in a balloon so that her mother could see she was starting to cope. Behavior modification: A 10-year-old boy acted out constantly and did not respond to normal punishment. The counselor created a “caught being good” plan. The child received a star for every positive behavior and a check for every unwanted behavior. To earn his reinforcing reward — an allowance — he had to be good only one more time than he was bad. The counselor encouraged the foster parent to set the child up to win the reward, so he gained stars for stopping in the middle of acting out or for flushing the toilet. He received lots of verbal praise for the stars and no verbal response for the checks. Perhaps the greatest challenge for counselors working with children in foster care is finding a way to also work with the myriad adults involved in the system. These adults include birthparents and any involved relatives, foster parents, caseworkers, casework supervisors, attorneys, educators and medical professionals, to name a few. It’s easy to become stuck in silo thinking, focusing only on the therapeutic process in your sessions and becoming frustrated when others do not support or engage in the treatment. During this turn of the kaleidoscope, counselors can remember to picture the colors and shapes of all the other involved adults, including these adults’ own histories of trauma and their own feelings of helplessness and frustration. This will help counselors keep empathy at the forefront of all interactions, thereby avoiding blame and patterns of disempowering, ineffective interactions. Reframe engagement as something the counselor is responsible for rather than it being the responsibility of the other adults in the child’s life. In other words, counselors need to take on the mindset that it’s our job to work with them, not their job to work with us. That way, if they don’t engage or respond to our efforts, it becomes our responsibility to try different engagement interventions. Trying different approaches might engage an adult who otherwise would not work with the counselor. For example, focus on asking birthparents and foster parents for help with treatment. Identify the birthparent as the expert on her or his child. Even if you do not use the advice or data the parent gives you, the act of asking is often enough to engage the parent. If collaboration with other professionals proves difficult, remember to empathize with their frustration over the many cases they have and the stress of their workload. Attempt to find compromises, such as shifting your schedule or using encrypted email to keep information flowing. Collaboration helps children in foster care in many ways. For example, it keeps these children from having to repeat stories over and over again. It also guards against having their needs fall through the cracks because everyone assumes that someone else is getting a task accomplished. Collaboration also sends a message to these children that they matter and that the adults in charge of their lives are making decisions together. We already touched on this topic under the “counselor’s worldview,” but it bears repeating. Self-care cannot be viewed as a luxury when working with this population. It is a necessary set of supports and adaptive coping skills. Self-care is subjective, not prescriptive, so it should involve whatever works for the counselor. At bare minimum, counselors should seek peer and professional supervision with others who have experience working within child welfare so that counselors can both vent and get validated. Remember that by nature, these cases are heavy with deep psychological wounding that will bring out countertransference one way or another. Building awareness and tending to your own reactions rather than trying to fight or minimize them will only make you a better counselor and person. Professional development support, training and consultation around specific troubling cases or treatment concerns, such as sexual abuse reenactment, severe posttraumatic stress disorder or deep attachment insecurities, can make a significant difference in supporting feelings of competency and utilizing best practices for the challenges these cases will present. Give yourself permission to notice any signs of depression, anxiety, grief and secondary or vicarious trauma in yourself, and then seek professional support. It’s also important and helpful to remember that working with clients with complicated trauma and attachment histories can become disheartening because the counselor rarely sees the type of progress that allows for professional satisfaction. Find ways to keep the work in perspective and balance work-life demands. Take time to seek joy and pleasure in life to prevent the type of burnout that ends up hurting rather than helping clients. Sheri Pickover, a licensed professional counselor, is an associate professor and director of the counseling clinic in the University of Detroit Mercy’s counseling program. She has been a counselor educator for 13 years and worked in the child welfare system for 20 years as a therapist, case manager, foster home licenser and clinical supervisor. She currently teaches courses in trauma, human development, assessment and practicum. Contact her at pickovsa@udmercy.edu or childwelfaretherapy.net. Heather Brown is a licensed professional counselor and art therapist in private practice in Detroit. She has more than 15 years of experience working with youth (both in and adopted out of the child welfare system), parents and professionals as a program developer, therapist, trainer and supervisor. Contact her at BrownCounselingLLC@gmail.com or BrownCounseling.com.